Danger Tree. See Hazard Tree. DBH. 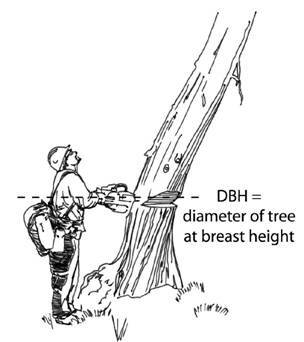 Diameter of a tree at breast height (4.5 feet above ground level). Debark. 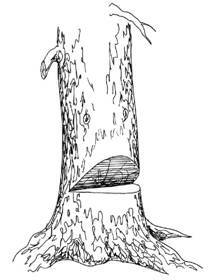 To remove bark from trees or logs. Devils Fork. A coniferous tree with multiple tops. These trees make head lean size up difficult. Direct Line. Any treatment applied directly to burning fuel such as wetting, smothering, or chemically quenching the fire or by physically separating the burning from the unburned fuel. Dogs. Metal spikes mounted on a chain saw near the guide bar designed to stabilize and support the chain saw during felling and bucking. Medium size saws will usually have an inside dog while larger saws will have an inside and an outside set of dogs. Chain saw dogs stabilize the chain saw increasing the sawyer's efficiency in felling and bucking operations. DolmarTM. 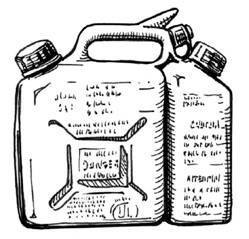 A container which holds saw fuel and chain oil in two separate compartments. DOT. United States Department of Transportation. DOI. United States Department of the Interior. Dutchman/Bypass. Results from the horizontal and/or sloping cuts of an undercut (face) not meeting or extending beyond each other. Very hazardous. 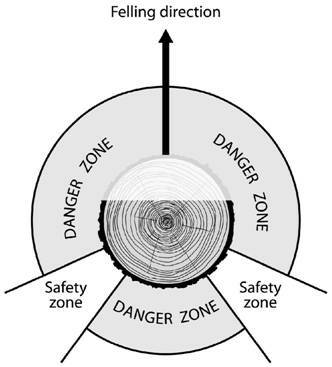 Can change the actual felling direction and cause loss of control of the tree. End Bind. One of the five basic tree positions commonly encountered while bucking. An end bind situation occurs on steep terrain where the force of gravity closes the bucking cuts. Escape Route. A predetermined path of exit used by fallers when felling or bucking. The essential components of an escape route are selection of the desired direction and distance, prior to felling or bucking, and a well cleared path through which to escape. Experienced Person. A person who has been trained and has participated in the subject process for a period of time, long enough to thoroughly acquaint a person with all the facets of the job being performed. Face. The side of the tree aligned with the predominate lean and/or the intended lay. The side of the tree opposite from the backcut. Facecut (undercut/notch). A 45° section of wood sawn and removed from a tree's base. Its removal allows the tree to fall to the predetermined lay. 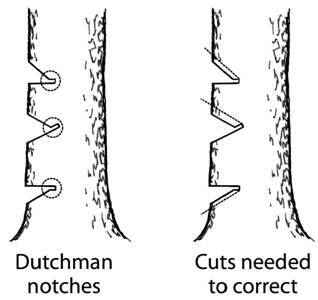 The face is comprised of two separate cuts, which have a constant relationship; the horizontal cut must be of significant depth to allow adequate hinge wood; the sloping cut must be angled enough to allow a wide opening and the two cuts must meet each other without overlapping (Dutchman). Faller. A person employed in felling trees. Faller A. An individual being trained or evaluated in introductory level, non-complex chain saw operations. Work of A sawyers must be under the supervision of a qualified Faller B or Faller C.
Faller B. An individual certified at the Faller A level who has demonstrated sufficient judgment, skill and knowledge to be trained or certified in moderately complex chain saw operations. Certified Faller B individuals may work independently on project or fireline assignments up to their level of skill. They demonstrate the judgment to decline assignments that exceed their skill level. Faller C. Individual who has demonstrated judgement and proficiency in correctly handling complex sawing and felling in wildland fire operations. Fell. To cut down trees. First Aid Kit. As referenced in this course, a kit including blood borne pathogen protective equipment (as a minimum, surgical gloves, face masks, eye protection, and CPR clear-mouth barriers) in addition to standard first aid supplies. Forest Service Approved. An item that meets Forest Service specifications and/ or drawings, or is procured under Forest Service authority. Fork Top (twin top). A coniferous tree with two tops.